Filed to: juniper? barely even know 'er! !Filed to: juniper? barely even know 'er!! juniper? barely even know 'er!! When I saw the new Starbucks holiday drink was a tree branch in my coffee, I knew I had to get to my nearest ’buckaroonies to find out what it actually tasted like. Was it going to be like gently sinking my teeth into some crisp pine needles? Or like someone slipped a shot of gin in my java? 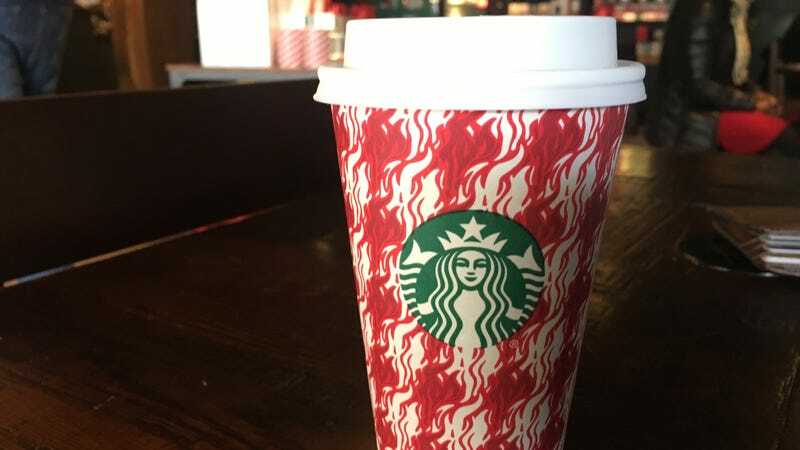 “This New Wintry Starbucks Beverage Will Get You in the Holiday Spirit” Fortune declared. As I ran down the street to get to Starbucks and in the holiday spirit, I passed some people selling freshly-cut Christmas trees. That’s my drink, I thought to myself, smiling. When I got to the store and threw down $5 for my Juniper Latte, I asked the barista if it was good. “Uh... yeah, it’s good,” she replied unconvincingly. Undeterred, I ordered away. My first disappointment was when I took a whiff of the latte and it smelled more like freshly-cut grass than an evergreen tree. No worries, I figured, a plant was a plant. I forged on and took a sip, only to encounter my second disappointment—the green flecks on top of the foam that are supposed to be some sort of special pine needle sugar just taste like... normal sugar. But all of this paled in comparison to my final disappointment: The coffee didn’t taste like a tree branch. Or anything, really. Maybe a hint of lavender? And some gingerbread cookie? I guess it’s supposed to be “subtle.” But I’d rather have a coffee and a shot of gin any day. Merry Christmas from…Joanna Gaines&apos; Tree of Bones?